When you think of the word whole when describing food, you usually think less processed; a product closer to nature. Unfortunately, with whole milk, that is not the case. Whole milk tends to be just as processed as any other milk unless it is raw milk. 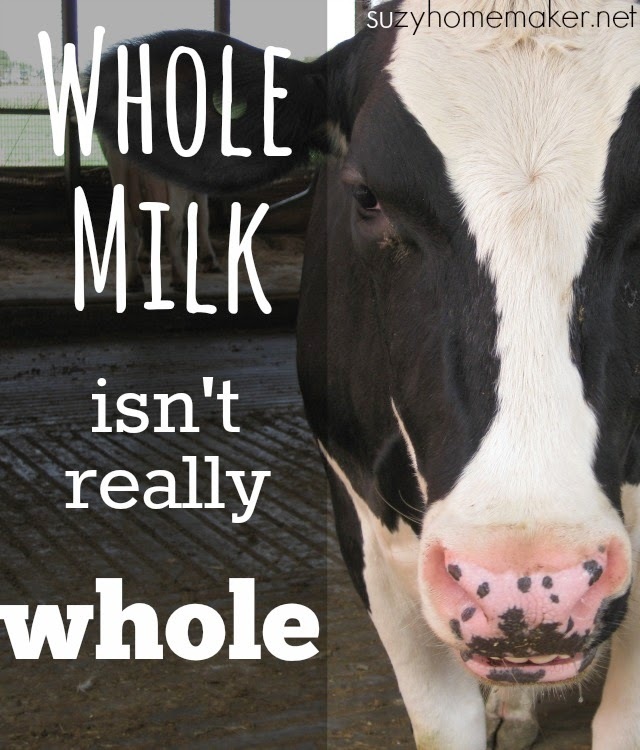 So what does the term whole milk really mean? It actually just relates to the amount of fat in the milk. There are regulations regarding how much fat must be in milk. Whole milk must have at least 3.25% milk fat. It can have more, but cannot have less. It would seem that for whole milk, dairies would milk the cow and simply take that raw milk and put it in a separate vat from the milk that would become skim or lower fat. But that is not usually the case. That would take more time, resources, and not be as efficient. Therefore they process whole milk the exact same way they process other milk. Which means that choosing whole milk under the assumption that it is a less processed product simply isn't true. If you cannot find raw milk, the next best thing would be unhomogenized milk from pasture-raised cows.